Dark Fantasy was an American Radio supernatural thriller anthology series. It had a short run of 31 episodes, debuting on November 14, 1941 and ending on June 19, 1942. Its writer was Scott Bishop, also known for his work on The Mysterious Traveler. It originated from station WKY in Oklahoma City and was heard Friday nights on NBC stations. The stories found a nationwide audience almost immediately. Today’s story comes to us from one of the most unusual authors of our time. Arch Oboler’s classic “The Revolt of the Worms”. 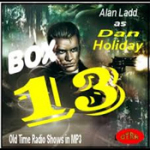 Listen to the first episode of Box 13 and see how it all began. 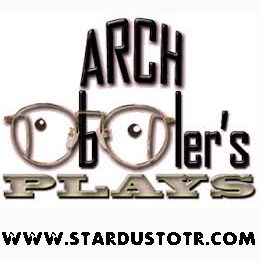 Audio horror gained an added dimension with Arch Oboler’s stereo LP recording, Drop Dead! An Exercise in Horror (1962). The cast featured some well-known radio actors: Edgar Barrier, Bea Benaderet, Lawrence Dobkin, Sam Edwards, Mick Ford, Virginia Gregg, Jerry Hausner, Jack Johnstone, Jack Kruschen, Forrest Lewis, Junius Matthews, Ralph Moody, Mercedes McCambridge, Harold Peary, Barney Phillips, Bill Phipps, Olan Soule and Chet Stratton. Ventriloquist Edgar Bergen achieved stardom playing both straight man and comedian with his wooden alter ego Charlie McCarthy. The Charlie McCarthy Show was one of radio s top-rated shows for nearly two decades. Button down and bow-tied, the gentlemanly Bergen would never behave improperly with a lady. Charlie, on the other hand, is frisky, flirtatious, and brave enough to bring his game to guests Bette Davis and Hedy Lamarr, among others. His love of the ladies leads him to many an entertaining exchange. The Maltese Falcon is one of my favorite OTR stories and movie. This series was introduced by several hosts. The West coast (Hollywood) was hosted by the series star, Boris Karloff. The East coast (New York) was hosted by an anonymous voice known as “Dr. X” (Dunning, 183), which some attribute to multiple talents (Digital Deli). Other stars occasionally appeared, including Peter Lorre, Bela Lugosi, Raymond Massey, and Basil Rathbone. But it was Karloff who regular listeners expected to hear as host to the proceedings. It was about the only part of the show that was predictable. Episodes like “The Hunt” featured typical horror gimmicks like werewolves, but with a twist ending that provided a new dimension to an otherwise common theme. As Karloff himself said, “There is no greater mystery than the mystery of the mind.” True to his word, many of the shows dealt with psychological, rather than literal, horror. In the werewolf story, we’re never quite certain if the monster was real or just a blood-thirsty persona the killer assumed. (It’s a classic example of the sort of story that was perfect for radio and couldn’t be realized as effectively in film or TV.) In another story, “The Final Reckoning,” a victim turns the tables on a thug and plans to kill him. He (Karloff) actually manages to take the place of a barber who is giving the thug a shave. The audience waits on the edge of their seats as Karloff carefully circumnavigates the long, straight-edge razor around his victim’s relaxed and extended throat. Just thinking about it now gives me the creeps (even by day). But it was a short lived series, lasting just 16 episodes. Less than half of those (7) are known to have survived. It’s an ending that is all-to-common in the history of OTR. The print ads for this series certainly go all out on the hyperbole. One reads: “WARNING! Persons suffering from heart trouble and those whose blood has a tendency to curdle and hair to uncurl under the stress of great excitement are urged NOT to listen… The station disclaims all responsibility for the health of those who insist on hearing this thriller.” Well, at least you can’t say you weren’t warned! 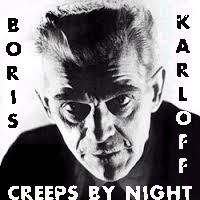 Creeps By Night promised all this and more. They told listeners to expect Karloff each week, along with other well-known Hollywood stars. They also promised new, original stories that were going to be written by the leading writers in the industry. However, according to Digital Deli, the new Blue Network didn’t’ advertise properly and started failing to deliver on its goals. Neither the upcoming stories nor the upcoming stars were advertised in advance. To make matters worse, the writers didn’t receive any on-air credit, either. Karloff stopped hosting after the 12th episode, and the unknown “Dr. X” hosted the final four episodes (voiced by at least two different people). It all unraveled from there. Yet the surviving episodes are quite solid and make fans regret the loss of such a promising series. It’s a sober reminder that success in the entertainment business takes more than good scripts and good actors– it also takes good promotion and a good deal of luck. Strange As It Seems was an American radio program that featured stories of stunning but true events that were first publicized by newspaper cartoonist John Hix. Hix’s format was similar to famous newspaper cartoonist named Robert L. Ripley of Ripley’s Believe It or Not fame . Both articles appeared in major newspapers, and both had a disclaimer printed under the cartoon stating that one should contact the author for proof of any story that the reader thought was untrue, and the cartoonist would provide proof. Strange As It Seems would go on from its humble cartoon roots to spawn a series of 10 minute movie shorts for Universal, before becoming a successful and long-running radio program. A short tale of two medical students playing a prank on some sorority girls but it goes completely in a different direction than you would think.